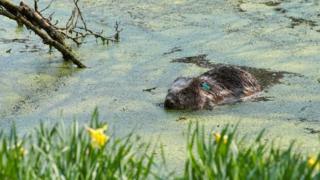 Two beavers have been introduced into a Yorkshire forest in an effort to naturally manage water flows. The pair of Eurasian beavers will be monitored to see how they affect the landscape and whether their actions can help prevent flooding. The five-year Forestry England project will check if the creatures maintain dams and boost biodiversity. The beavers, called "natural habitat engineers" by ecologists, will live in a large secured area. During their time in Yorkshire, the beavers will be monitored in their 10-hectare enclosure to see how they interact with artificial dams in place in Cropton Forest on the North York Moors. Scientists say this project, which will see beavers eventually released in other locations, is the first time the effect the species has on artificial dams has been studied. Forestry England's Alan Eves said: "Today's landmark occasion sees the introduction of a cornerstone species that has been absent from our landscape for over 300 years. "We are looking forward to seeing the beavers settle into their new home and are very interested to watch how they impact on the water flow and surrounding ecology." Ecologist Cath Bashforth said: "Beavers are natural habitat engineers, restoring complex wetland habitats and providing habitat for declining species whilst slowing the flow of water downstream."